FEELING MATTER: EMPATHY AND AFFINITY IN THE HYLOZOIC SERIES. How might such a condition be rendered in physical matter? What connections lie between such material and emotional realms? Deliberate weakness, embedded into individual component design, allows force shedding in composite assemblies. Large stresses on the environment are absorbed and dissipated, shuddering throughout interlinking structural meshworks. The hovering environments are composed of filtering layers of deliberately fragile laser cut acrylic elements. Brought to the edge of stability, raw material moves to the limit of bounded forms. Replacing design equations of clarity and power, the forms of components that make up these structures are designed for resonance and potent interaction. Instability becomes a virtue, pursuing resonance and sensitivity. Material turbulence is offered as a primary design quality, oscillating between expressive imagery and objective performance. A hybrid anatomy akin to a diffusely layered fabric condenses out of these arrays of many parts. The conception of this work draws on new imaging techniques that reveal potent layers of ephemera surrounding the human body. High definition thermal cameras, for instance, illuminate a landscape of furled plumes, passing inward and outward through our breathing bodies. Perhaps these images share a kinship with the radiant vision of a mediaeval painter, rendering thickened auras around divine figures. They imply a world far removed from starkly defined borders, and stand opposite to a modern cultural tradition of clarity and power. Instead, they suggest intertwining, diffusive boundaries that lie between individual bodies and their surrounding milieu. And yet for all of their implied potency they do not seem to speak of environments that readily increase human power and domain. Instead, we become aware of the gentlest of impacts: air, moving around the body, perhaps charges in surrounding magnetic fields that we disturb as we pass. Interaction renders legible the many presences and many dimensions latent in this expanded field. Could this kind of transitional field offer emplacement in the world? Past traditions of placemaking might speak of strong, stable boundaries, but this work does not claim the earth as a stable resource for the framing of human territory, nor is it a prosthetic apparatus for the extension of power. The transitional field is fraught with ambivalence and riddled with oscillation. This field speaks to the porosity of our own subjective boundaries and the composite nature of our identities. It might offer a fertile starting point for reimagining the shape of a renewed public architecture. The journal entries that follow form a parallel vein of inquiry to our explorations in architecture and sculpture. They speak of material systems and embedded intelligence, and seek an orienting lexicon for describing diffusive space. Can soil be constructed? The Hylozoic Ground project imagines new layers of amphibian soil. Soil has always been the prima materia of architecture. Soil might seem to stand silently, apparently offering secure mass and compression, available as plastic, friable resource for framing human territory. But contemporary soil does not quietly offer itself to the enlightened framing of space. Soil desires springing growth. The soil crust of the earth seethes with a myriad of seeded viscera, miniscule fragments gathering and efflorescing, redolent with chorusing oceans of growth to come. Soil builds, an inexorable flowering genesis of matter. The stuttering oscillation of soil’s alternating collapse and expansion sends shivering waves that choke certainty. Soil’s lumpen, sodden masses counter any enlightened world of social construction. The ambivalence latent within soil makes it a monstrous doppelganger for architecture. And, standing here today, the soil of my fever-laced biosphere speaks of inflamed flux, efflorescent growth oscillating in wild swings punctuated by unspeakable silence. Standing within this tumbling ground, my posture pulls toward spasm. The yawing, viscous ground induces queasy vertigo. My legs unconsciously tense themselves, reptile brain–inflected posture tensed by the inward pulling, elastic meniscus underfoot. The shift of my own posture inverts any confidence within my outward gaze. Any bounded territory recedes. Spring floral, the gentle, murmuring field. Like the faint ocean swells tuned to the infant-glossed octaves that welcomed plasmodia, then notochord, then sinuses. Amidst the caustic blunted grid declared by other neighbours, what of this generosity, this hovered breath of nurture? Calm. Rising. Calming, rising, rising. Coils merging from sleep. Fine thinking. Surges, I follow nested threads. Predisposed: like the twigs that bifurcate from branches that gather from trunks from the thundering tap-rooted mass-bound ground, lacing across the darkened sky there as I look. Individuals. Smallpox-laden four-point pure wool Bay spreads, laden with warmth. Why, in each pore, is there a clutching stricture? Why, in each jelly-warm octopus’ kiss, blade? Or then why simmering warm in the abject insect jaw- why even bother with blood with touch with gentle kind gestures if a viral pinchclamp would do it? Strewn across the scrub-trash plain revealed by spring melt are a myriad of puddles, settled into sodden ground, collectors: oil-rainbow glazed, ash-sediment base thickened, last season’s mold sloughing off partly submerged twigs and tendrils. Too diffuse to qualify as tension, but with enough insolent potency to cough up a rictus if the game were called. The surface pit beneath each of my clavicles feels ready for that kind of duty, dull aches sprinkled with ready-to-convulse tendons. The lee of my elbow, inward, soft. Inside the knees, and beside the sinews flanking. And the little wells at the base of each pair of fingers. The deeper entry toward nerve-cluster between thumb and first digit at metatarsal. Ankles below the joint, sole high within the arch. Behind high in each thigh, close to the burly implants of sinew in femur. Throat, at the front base. Fontanel obviously. Not to speak of the pool converging at the centre of our caged breast. Map of body, slow-shifting caustics and acids corroding soft-tissue wells. Muscle sheath, cleavage-fissure working in to cores running alongside bones, the relaxed eddies created by spaces in between sinews just before their intersects collude. Pools, cruelly, where collagen and poor spent plasms might otherwise find relief, recovering. In the lee of the joint. Not resolved for work like the resilient inner and outer pad layers between my vertebrata. Not resolved for birth, like the enriched ready-to-boil plasma of stem cell marrow. Taken unawares, dewey-saucer-eyed throng-gel-foams first irrigated with a tease of delight, then pulled void. Not resolved, but waiting, interregnum. The space that lies in the sheltered lee quietly rebounding just short of the pinching joint of two converging vectors, hollows where I might have paused to rest had I been a soldier. In those places lie dark pools. That lee housed the material that would carry the charge. Limbic fountains quickening with spring, leavening. Lemming-infants unhesitatingly acting. The habit of thinking positively, not as a leaden mask but as a buffered encapsular sheath for the surging core. An interpretation-gate: this thing is possible, salved opening. With emotion-compass, medium where the pattern can hold. Forlorn orgone? Clouds could receive just this charge and flesh could find it after: filtered, buffered, invigorated. The organizing systems of the Hylozoic topology are guided by variation, flexibility, and order. In contrast to design principles that favour optimal equations where maximum volume might be enclosed by the minimum possible surface, the structures seen in the Hylozoic environment prefer diffuse, deeply reticulated skins. These forms turn away from the minimum surface exposures of pure spheres and cubes as they seek to increase their exposure and interchange with the atmosphere. Special tessellations, space-filling arrangements of individual structural tile units, are used to organize the textile-like layers of the Hylozoic Series. Hexagonal meshworks are organized by a three-dimensional triangular array that guides fields of attachment points. Because these organizing systems use suspended, flexible fields of attachment points, warping and buckling can readily occur. This permits multiple orienting systems to be used in parallel within the same environment. Non-repeating ‘quasiperiodic’ systems tend to appear in parallel with repeating periodic grids of rhombic and hexagonal forms. Penrose tessellations, conceived of by British physicist Roger Penrose, are generated from sets of ‘prototiles’ that make up tessellation patterns. While local symmetries and repeating clusters of units appear throughout a Penrose tessellation, the fabric as a whole does not repeat its patterns. Preceding projects that employ Penrose organization include Orgone Reef, Orpheus Filter, and Implant Matrix, and can more recently be seen in the filter layers within the Hylozoic Series. Variations within rigid geometric patterns also occur when bifurcations and hybrid elements are inserted within ordered arrays. In recent projects, intersections between overlaid tileworks provide special qualities that include large-scale foam-like patterns. By combining hexagonal and Penrose arrays, and allowing for some twisting and warping to reconcile in three dimensions, warped foam-like fabrics appear. The resulting geometry suggests an ability to handle structural forces and invites circulation and component organization, indicating a potential for multiple-function systems. The organization of the microprocessor-based interactive system embedded within the Hylozoic environment includes a communication level, and a control level. The higher, or top, level of organization is composed of a communication system that enables neighbourhood behaviours and global behaviours – reactions in composite. This is achieved through a ‘one-to-many’ communication system where all nodes within the sculpture listen to one channel, and all nodes send messages out on a different channel. This is complemented by a translator node outside the sculpture which listens to all of the nodes in the sculpture, and sends filtered and translated messages back out to all of the listening nodes. The lower, or bottom, level of organization is composed of a control system that directly generates local behaviours – individual node reactions. The control systems currently being developed at our studio are moving toward a limited ‘embedded intelligence’ within the environment. This will allow for a more distributed organization where individual nodes are connected to multiple sub-nodes, each directly wired to transducers (sensors and actuators). The sub-node takes a control signal from the root node and translates it into sets of individual transducer control operations. Next generation developments planned for this interactive system include incorporation of both wireless communication and structurally integrated power wiring. These measures will allow freedom in node placement within the lightweight meshwork structures. Also envisioned is a step beyond the relatively rigid pyramidal organization of a ‘one-to-many’ network, toward a new intermeshed communication system. This will allow for peer-to-peer, or ‘many-to-many’, communications and ‘group decisions’ of sculptural components, freed from communicating through an external translator. These future developments will also include the introduction of ‘subsumption’ architecture, a behaviour-based control strategy used to enable automated reflex-like links between sensing and actuation, without the involvement of higher-level processing. An analogy of subsumption may be observed within human physiology, where bundled ganglia such as the sensitive clusters within elbows, knees, sternum and pineal are configured to cause muscular reflexes automatically, before the brain is notified of sensory events. This control strategy would allow layers of increasingly complex local behaviour to be orchestrated. Currently, when viewers encounter a sensor below one of the filter nodes, the resulting signal travels up to a locally shared microprocessor for interpretation. Signals are in turn sent back to the local actuator, causing twitching reflexes at the site of the original signal. With subsumption features, embedded reflexes directly at the original site could occur, free from the need to involve a shared processor. Sensor activity, however, could still be reported and the output control overridden by multiple layers of higher-level controllers. This feature offers the potential for a greatly increased flexibility and complexity in the level of sculptural behaviour experienced by viewers. Finally, sensor functions are also being developed to enable thermal, optical and acoustic inputs. Body heat, and related intimate human physiological responses may be tracked by these functions. A future intention is to enable pheromone sensing, employing engineered protocell functions that can function as specialized ‘chemical noses’. The adaptive chemistries within the wet system capture traces of carbon from the vaporous surroundings and build delicate structural scaffolds. Engineered protocells and chells (liquid-supported artificial cells that share some of the characteristics of natural living cells) are arranged in a series of embedded incubator flasks. Bursts of light and vibration, triggered by the responses of occupants moving within the work, influence the growth of the protocells, catalyzing the formation of vesicles and inducing secondary deposits of benign materials. Sensors monitor the health of the growing flasks and provide feedback that influences the behaviour of the interactive system surrounding the viewer. Protocell presence within Hylozoic environments illustrates new design research now focusing on the speculative implementation of protocell chemistries into architectural systems. This research has implications for architecture and the built environment as a whole, suggesting that the development of near-living smart materials is achievable. These materials could quite literally ‘grow’ themselves, sense and respond to environmental stimuli, share resources, filter pollutants, and self-repair. Future Hylozoic systems will allow for the synthetic biology that currently occurs in vitro (in glass vessels) to move outwards, ex vitro, and into a primitive artificial circulatory system. Part of this would include incorporating a new sensor network, which could read the density of chemical flasks and adjust surrounding environmental conditions to support protocell growth in other areas of the system. Pheromone sensing capabilities are also being developed, so that octaves of expanded physiology around a viewer could become an architectural space. The cloud of chemistry emitted from a viewer would itself become a tangible medium. 1. 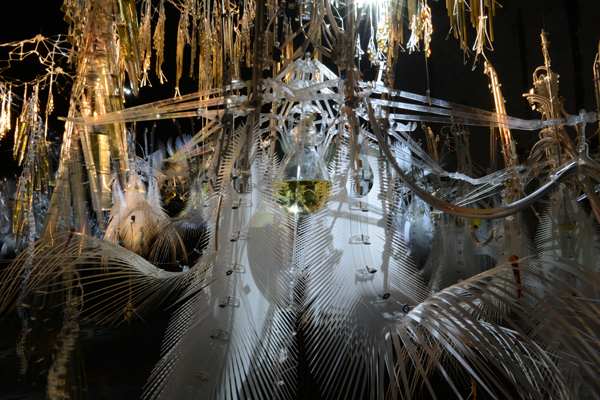 Passages of text from this essay appear within the text entitled ‘Empathy and Affinity in the Hylozoic Series’ by Philip Beesley, within the book ‘Architecture In Formation’ edited by Aaron Sprecher (Routledge, 2013).